Like many, many kids who grew up in the Midwest, my family had a ‘clean your plate’ dinner policy. I was encouraged to try two bites of everything and wasn’t allowed to leave the table till those two bites of panfried sunfish and green beans made their way down my gullet. It was a super common approach to eating and child-rearing and probably a good one for me. Left to my own devices, I would have survived solely on spoonfuls of peanut butter and noodles bathed in margarine and powdery Parmesan cheese. But these days, I cook for myself (even though I’d still happily live on peanut butter and noodles) and I seem to have printed that ‘clean your plate’ policy onto the very marrow of my bones. made a meal of what your friends/kids/partner couldn’t finish at the restaurant – a lovely dinner of fish sticks, tomatoes pulled off the salad, and half a bowl of soup. I’m such a non-waster that this policy has trickled over into all the other areas of my life. Someone gives me a scented candle I don’t really like? Guess my apartment smells like grandma roses for the next two months. I buy some $5 shampoo that makes my hair weird? I’ve got new volumizing, shine-improving body wash, apparently. Bought some bitters for one specific cocktail recipe? Welp, everything has bitters now (even though I don’t really like them). If you’ve got pan full of roasted potatoes you’re not particularly into, you’re not contractually obligated to finish them. You can bring them into work and leave them in the break room. You could put them in a Ziploc bag and give them to a homeless person. You could dump them in the ever loving compost bin. The world will not end if you don’t eat every single thing, ever. If your new, expensive makeup primer somehow makes your skin shinier, you don’t have to keep periodically re-trying it, hoping something’s changed. (Am I the only one who does this?) You could pass it along to a friend who has a different skin type. Or you can just wash the bottle out and recycle it. We all deserve healthy, delicious food that we actually like and meals we made on purpose. We deserve shampoo that makes our hair bouncy and makeup we actively chose – rather than what came in the freebie bag. I’m still working on ‘treating my body like a temple’ but I think not treating it like a garbage can is big step in the right direction. Do you ever use things you don’t really like – food, beauty products, other consumables – just so they won’t go to waste? I so agree with this. Just cause you bought something or it was expensive doesn't mean you have to finish it. I don't believe in wasting but there's no point in doing something you don't like. Love this! I hate wasting things but then always think – do I actually want to put this in/on my body? Great post. I do this too. But, for me, it's mostly because money is super tight and I don't like spending money on groceries if I have stuff I can throw together to make a meal already in the house, even if it isn't the greatest meal ever. I used to do this all the time, but I think I've finally got the "don't treat your body like a garbage can" thing down. Maybe not so much with beauty products (I just started using a Bath and Body Works body wash that I don't like because I wanted to use it up) but food seems to be a lot easier for me to implement this type of policy. oh god THIS IS ME… not just at home, but even moreso at the work conferences i facilitate, where i see a big buffet of food that i know will go to waste if attendees don't eat it! i function like i lived through the Depression or something.. ha. Ha, that is why u should have chickens. They luvvvv leftovers! A lot of places (Sephora, Nordstrom) have really good return policies. You use it and if you hate it you can bring it back. Great idea about bringing leftovers to work… I've done a lunch exchange with a co-worker buddy, you both get something different! I bought a sweater last Fall that I thought was the sweater I was looking for all my life. It looked horrible on me and I didn't realize that until after a mini photo shoot with my family. I couldn't just donate it because I had spent too much money on it (on a rare binge) and so I tried to offer it friends talking up the fine knit and the lovely color. My friends returned it to me and suggested I find someone with smaller hips. So it sat in a bright pink bag at the foot of my bed for months. Eventually what happened is that the store where I bought had a trade-in offer: bring in a gently used item and get 25% off something else. I didn't even hesitate. I took it in on my birthday and got something that suits me….This is a very self-centered, superficial story (I know!) but it is the truth of where I was with that sweater and now I'm far more hesitant to buy something that expensive. Lesson learned. It's a Southern thing, too. My mom was always in the "clean your plate" mindset. I tried my hand a crock pot recipe which failed miserably. Now I have a bunch of it in my fridge that isn't going to get eaten. I think I'll pack it up in plastic bags and leave it in the fridge at work with a sticky note that says "free". love this! In my saving money efforts, I feel terrible about throwing stuff away… I need to get better about just letting things go! This actually reminds me of the one thing from my economics classes has stuck- once you buy something, it's a "sunk cost". You've gotta forget about how much money you spent; that money is already gone! Don't make it worse by forcing yourself to eat/use whatever you bought if you don't like it. Then it's a waste of money AND you're punishing yourself. Lose-lose. I really like this. I'm such a guilt hoarder. And I hate it because it makes my life feel so cluttered and unnecessary. But I feel SO guilty throwing away perfectly good things. Composting has really helped in that regard. Now if I can just get rid of the 3 extra bottles of shampoo and conditioner in my shower…..
Also, I saw a few days ago that someone posted a comment about the bolded sentences running off the page. I see the same thing on almost all your posts. Can I email you a screen shot? Oh how I need this reminder all the time. I'm going to go home and throw away that berry pie I've had in my fridge for a week. If I don't want to eat something I usually just let it sit in my fridge and go bad so that I'm forced to throw it out. It's a really terrible way of keeping my kitchen, especially since I'm trying to keep better track of what I'm eating in general. Thanks for putting words to my thoughts – impervious thoughts that cycle and cycle and make me bonkers. Love your writing! Crikey. Get out of my head! I struggle so much to throw stuff away that is still perfectly serviceable but that isn't right for me, especially after I've done my best to rehome it and failed. And the "clean your plate" thing. I've only just learnt how to not feel guilty about leaving food on my plate. My fiance is definitely a guilt hoarder of pretty much everything, which mostly works okay because he really doesn't seem to mind (he could probably eat 4000 calories a day and still be underweight, so it's not like eating the not-great-stuff doesn't mean he won't follow it with something yummy later). With years of eating disorder recovery behind me, I almost flipped to the other side — if I don't WANT it, I am not going to eat it — I just want the TASTY stuff, because dammit, eating is a pleasure. So luckily I have a human vacuum cleaner who will. Oh, man: trying the same makeup product again and again hoping for difference results. I do that! And why? But anyway, the rest of your post: YES. I am from the midwest, but I was never told I had to clean my plate. I understand parents don't want to waste food (I hate wasting food!). But the point is, how is it more wasteful to put something in your body that it doesn't need…than to put in in the garbage? It's a mental thing, I am convinced. Be good to your body. It's the only one we have. Great post, Sarah! Saving money to run out of debt is my top priority since I graduated from high school. I was through this for so many years. Thanks to your article I realized that I am really treating my body as a trash can. And this have to be fixed! I think that I just cross the line with recooking the leftovers and using suspicious cosmetics. Thank you for publishing this, I will do my best to change the way I am used to live. Are you living inside my head?? This is an issue I've been working on for several months now. I'm getting better about letting things (food, clothes, etc) go but as you know, habits can be hard to break. It's nice to know I'm not the only one struggling. This post was amazing. Thank you so much for reminding us of all this! Thank you for this! As I read this I was eating three-day-old leftover stir fry that had gone soggy and was leaving a really weird taste in my mouth… and now it's in the compost bin! Hey! I was thinking about this in the wee hours of the morning when I was up with my daughter. What are the bitters? Want to trade for some tasty and one-of-a-kind simple syrups? Just curious. I can most definitely relate. Thank you, Sarah, for the thoughtful post. You so called me out on this one. I am utterly guilty of eating all the leftovers no one wants just because I don’t want to waste them and I’ve had some pretty interesting shampoo-body washes, too. I hate the idea of spending money on something when it would ALSO mean I’m wasting something else. so late to this, but don’t forget on makeup, etc., you can return it too! I used to just keep the products and recently overhauled my makeup (next up is hair stuff :x) and got rid of a TON of things I kept because I didn’t want them to go to waste. a lot of it was still usable and I donated it to friends/shelters but some of it was so old anyway I’m not sure why I was holding on. Ooooh, good to know! I’ve never tried to return makeup before! 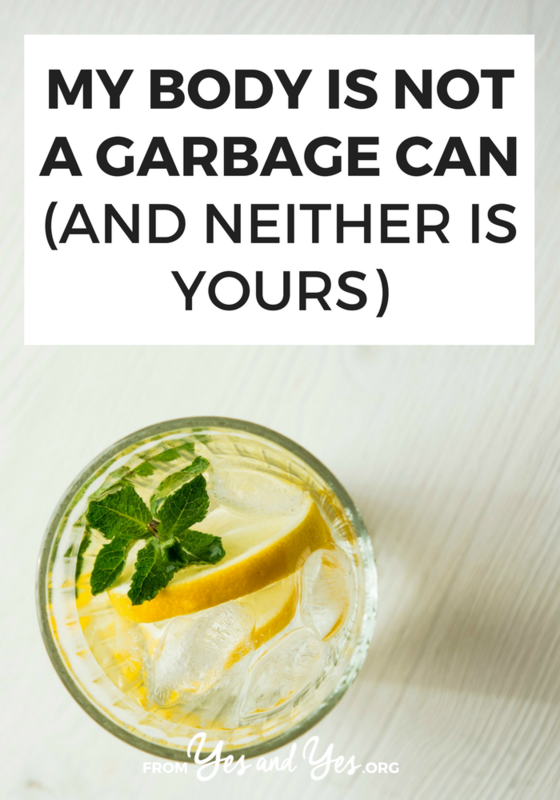 I literally came across this article because I came to the same conclusion: I am not a garbage can! I just ate an entire tin of rośe gummy bears because I felt like they had been sitting too long, they were expensive (like $9 from Sugarfina) and I wanted to use the cute container they came in for something else. On the other hand I threw out an entire container of leftovers from a meal that didn’t taste too good so maybe it’s like a 2 steps forward 1 step back type of thing.